It's almost becoming a trope that getting started with React can be overwhelming for beginners. We've covered advanced data architecture a couple of times, so I thought that this week it would be good to cover some resources beginners might find helpful (don't worry, we're still brewing lots more advanced content). 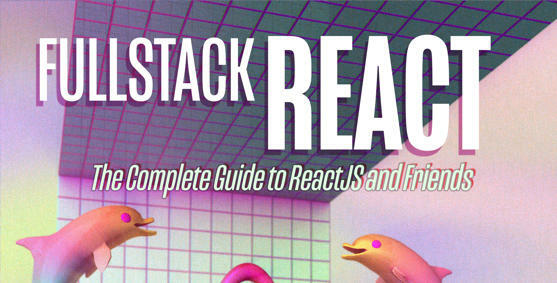 The first thing I want to tell you is that we've started writing a book on React. It's still pretty early, but we have an all-star line-up of authors. It's going to be really good. Below you'll also find out how to use React from ES5 (no JSX, no Webpack), meditative React koans, and, if React makes you sad, a way to become happy again. If there's one thing I've found writing this newsletter it's that there are tons of different opinions about how to structure React code. However, sometimes you just want someone to tell you the right answer and not have to spend hours researching all of the competing options for every module. So we're doing something about it and writing a book. It's pretty early, we only have 3 chapters done so far. But we're going to be talking about GraphQL, Routing, advanced components, forms, Redux, and a lot more. Checkout the sample chapter on the site and we'll let you know as we write new chapters. This book is shaping up to be really awesome. This article is a long, detailed tutorial that teaches how to use Redux, Immutable, Router, Babel, etc. to build a voting app. It's been updated several times, and its a great intro to using Redux. This is another tutorial that shows how to create a todo list with redux. JXS, Flux, ES6, & Webpack are all super-useful tools for writing React apps, but they also increase the learning curve for someone who only knows ES5. And it can be handy to peek under the hood and see what's going on even if you already know these technologies. In this article, James Nelson shows you how to build a React app using just the ES5 APIs. File & folder structure is one of those things that is underrated - everyone has to decide how to layout their files, but it's very rarely taught. The two schools of thought here tend to be by "nature" (models, views, reducers) or by "feature" (homepage, profile page). This article talks a bit about how to organize your files and gives some suggestions. Fwiw we've seen a huge movement towards organization-by-feature in large, production apps. It makes it easier to have all the related code close together. In this (free) course by Tyler McGinnis you'll learn the basics of React, Routing, and working with Webpack. It's widely regarded as one of the best video tutorials on the web for getting started with React. This project is a set of React Koans. In this post, former Facebooker Pete Hunt gives his take on how to approach the React ecosystem. Dan Abramov has also created a great flowchart of this post in react-makes-you-sad.